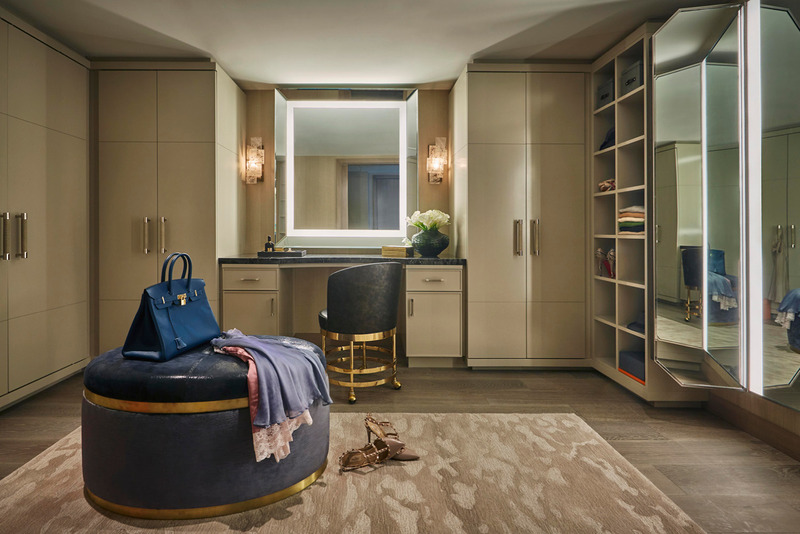 Inside a luxurious suite of the Viceroy L’Ermitage Bevery Hills. You could spend all day in bed, and you should. 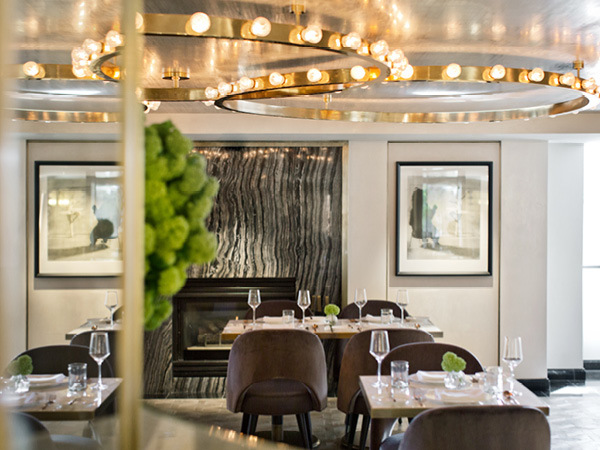 Inside Avec Nous, the restaurant of the Viceroy L’Ermitage Bevery Hills. 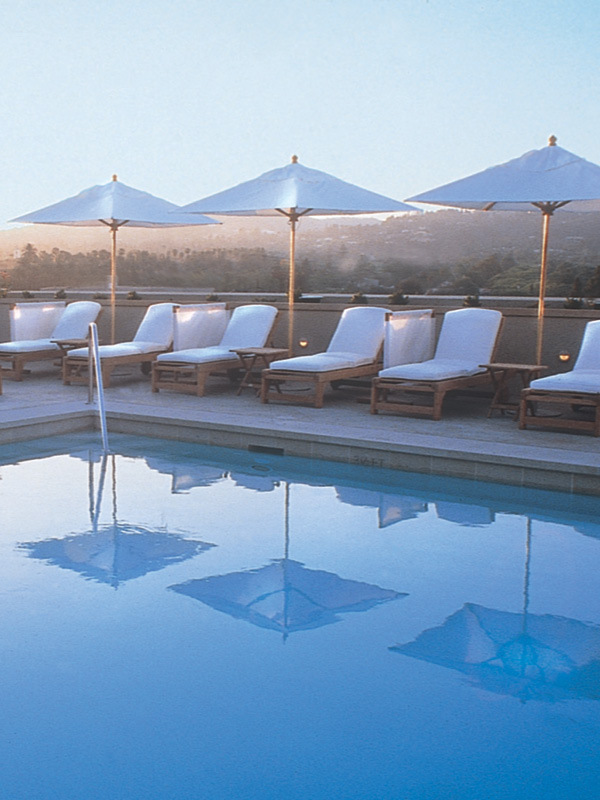 Poolside at the opulent Viceroy L’Ermitage Bevery Hills. You never know who you’ll bump into in Beverly Hills. Shonagh Walker stops by one of the exclusive suburb’s most luxurious hotels and finds herself discussing its many merits with one of the world’s greatest rock stars. Eighteen years is a really long time between drinks. Which is why when I clocked Foo Fighters’ drummer Taylor Hawkins by the bar at the rooftop pool at Viceroy L’Ermitage in Beverly Hills, Los Angeles, I was sure that in no way would he recall our last encounter. It was in the late 1990s, at the Ricky May Bar in the Sebel Townhouse, Sydney. We’d been partying post-Big Day Out with mutual record industry friends and the cocktails were flowing so fast that I barely even remember it. I took a gamble reintroducing myself and sure enough, he remembered the lengthy drinking session well. As we soaked up California’s glorious rays, we reminisced about the Australian music scene’s glory days and, in between his stories about living next door to the Kardashians, lamented the loss of such an iconic hotel as the Sebel Townhouse. As is the case with many of Sydney’s landmark buildings, it was closed in 2000 to make way for residential and corporate apartments. Along with its closure came the death of a Sydney icon that had hosted the likes of David Bowie, Elton John and Jack Nicholson. It also marked the end of a late-night entertainment scene that Sydney hasn’t seen the likes of since. We remarked how conversely our currents digs, the uber-luxurious Viceroy L’Ermitage Bevery Hills, has since its opening in 1975 remained a Hollywood institution. Despite being only a short stroll to Beverly Hills hotspots like Rodeo Drive and a few minutes’ drive to Hollywood and Santa Monica, its location on a tree-lined residential street ensures all guests receive the ultimate in privacy and security. Little wonder mega-stars like Elizabeth Taylor, Richard Burton, Laurence Olivier, Jennifer Aniston, Angelina Jolie, Ben Affleck, Brad Pitt and yes, Taylor Hawkins from the Foo Fighters, have called it their second home several times over the years. Spacious and luxurious rooms aside (more on them later), the hotel is a favourite of celebrities and those who wish to be treated as such, for myriad reasons. Let’s start with what was once known as ‘The Writer’s Bar’, where Ben Affleck and Matt Damon penned the script for Good Will Hunting. Other legendary screenplays were devised here too, including The Godfather, The Graduate and Jaws. That’s some serious silver screen history. Located in the lobby, it’s now simply known as the bar/lounge and it’s still today the ideal setting to knock out a story, sip a laid-back cocktail and spot some famous faces (it’s a known industry hangout). Fancy a bite? Avec Nous, the restaurant located within the hotel, is a contemporary take on a classic French bistro and offers an exclusive Beverly Hills dining experience. Open for breakfast, lunch and dinner, the menu is a mesh of flavours from the Mediterranean coast, with Spanish and Italian influences and a hefty dash of St. Tropez nuances. Drawing on local and seasonal ingredients dressed uniquely in European spices, you can choose from healthier options that favour your fitness regimen or indulge in decadent dishes that are the stuff Cheat Day dreams are made of. From chilled watermelon soup through to croque monsier, there are flavours (and kilojoule count) on offer for every desire. Avec Nous also facilitates the 24-hour room service available, which is just as well as you may not ever want to leave your room. Even the most basic studio suite is twice the size of a regular hotel room and boasts a lounge area, runway-inspired dressing room, marble bathroom and a carefully curated art collection. Each king bed sports luxury Sferra linens that you’ll sink into as you lie back and watch TV on your Samsung HD TV with Bose speakers. At the top end of accommodation, the Viceroy’s residential suites take luxury next level. Spanning 111 to 408 square metres of space, each offers a king bed with the aforementioned trappings, balconies overlooking iconic Hollywood sights (including the Hollywood sign), entertaining areas and a full kitchenette, amongst other indulgences. 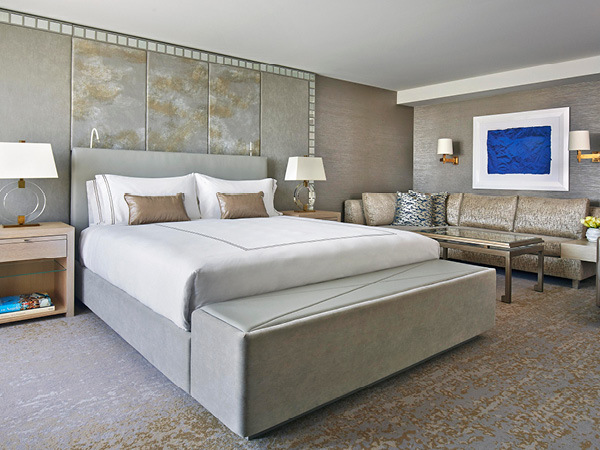 No matter what room you choose, you’ll love pampering yourself with the custom-made amenities. The all-natural range of hair, skin and body care, ROIL (a portmanteau of royalty and oil), was created in conjunction with Amanda George, an international celebrity hair colourist based in Los Angeles, who’s famed for toning the tresses of Victoria Beckham, Charlize Theron, Kate Hudson and Jenny McCarthy. Any hotel worth its salt will have an exceptional spa and, as you might guess, Viceroy Beverly Hills does not disappoint. From Gentleman’s Express Facial to the needle-free anti-ageing Injectstem Bio-Firming Facial, Jet Lag Massage, Himalayan Superfruit Body Peel and the warming Pumpkin Spice Body Peel and Wrap, there’s a treatment to pamper even the most precious of tastes. There’s also a state-of-the-art fitness studio, which offers complimentary yoga on Saturdays. No worries. Babysitting services plus a host of kid-friendly services and offerings make family stopovers a breeze (think: customised excursion planning, child/parent luxury robes and slippers, pool toys and treats and signature child tipi play tents). Want to bring the fur kid too? The Viceroy is pet friendly to animals up to 22 kilos, with dining and care service to pamper your pooch. There is a $207 fee to house your pet at the hotel, which may seem steep, but it’s well worth it – 50 per cent of that fee is donated to Wags and Walks, a local adoption centre and community that works to find forever homes for shelter dogs. Should you decide to step outside the hotel and enjoy all that’s on offer in Los Angeles, be sure to lean on its complimentary car service, which will take you anywhere in town for the price of a tip (be sure to tip generously; it’s how the drivers earn their living). They’ll also return to pick you up whenever you’re ready – simply call the concierge desk with your current location. After all, we’re in California. With its 360-degree views of the city and private cabanas, you can easily while away a week here. There’s a fully stocked bar adjacent to it, plus an enticing bar menu, from which I was enjoying a glass of rosé and a vegan burger when I bumped into Taylor. Relaxed and gently tanned, he happily chatted for an hour or so before heading off to rest before his show later that night. As we wrapped up the conversation, I felt an overwhelming sense of disappointment. Not because I was bidding the world’s best drummer goodbye, but because I realised that it was time for me to check out of one of the most special hotels on the planet. I reminded myself that unlike Sydney’s Sebel Townhouse, the Viceroy was unlikely to become a distant memory any time soon and nor was my stay. You see, not only does the Viceroy accommodate your special requirements and requests, but each is meticulously detailed and recorded to ensure your expectations are once again exceeded upon your next visit.